The discussion concentrated on a particular passage from the GizaPyramid.com website. We continue from the point within these results where we left off in the previous article. d) On the territory of one of a number of oil wells, a small pyramid was installed. In a few days after that the viscosity of the oil in the seams decreased by 30 %, the production rate of wells accordingly increased. Petroleum composition (amount of gums, pyrobitumen and paraffin) started to be altered. The fractional composition of oil was offset in the side of mild fractions. Experiments made with the participation of the Gubkin Moscow Academy of Oil and Gas have affirmed those results. e) Before sowing, seeds of agricultural cultures were held down in a pyramid from 1 to 5 days. Tens of thousands of hectares were sowed with more than 20 cultures. In all cases the increase of a crop was from 20 to 100 %; the sowings were not sick, a drought did not affect the crop. The amount of toxiferous matters in plants was decreased sharply. When an outline of small rocks that had stayed previously in a pyramid were placed around the crop, similar results were obtained. Among other studies with less authentic results the following was noted. (a) The level of toxicity of any matters including toxic and poison matters, which had been under the exposure in a pyramid even short time decreased. (b) The level of radioactivity of matters held in a pyramid diminished. (c) The level of pathogenic of different albuminous formations (viruses, bacteria), that stayed in a pyramid is slashed. (d) In a range of the pyramid action, or in a range of subjects, which were held in a pyramid, the performance of any psychotropic influence upon people diminishes. (e) The rather reassuring data are obtained in case of applying standard solutions (glucose, isoosmotic solution, etc.) intravenously and outwardly at alcoholism and drug addiction even in the very much launched shapes. At this point, many may already be used to the science-speak commonly used within these texts. However for those who may not be, and for the sake of our detailed study, lets break it all down. One particular study conducted by the Russian scientists involved a classified scalar, radio-location device which was designed to detect ionized gas particles in the atmosphere, and translates this data into visual information. This device was obtained by the R & D Institute TTR. ("TTR" stands for "Scientific and Technical Institute of Transcription, Translation and Replication". Though it would be nice to know more about this device, it is currently still considered classified technology. It may very-well still be in use in modern times, though a more advanced version would likely have been developed. We do know that it is able to sense ionizing radiation, and that it is much different than the typical radar system.) 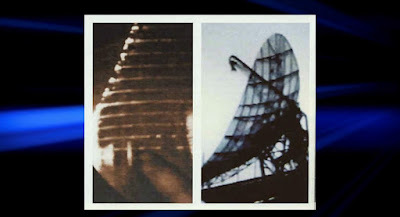 The image below features this device, and one of the images it captured during the study of the 140-ft tall pyramid. As you will remember, these pyramids are hollow on the inside. They are shells of PVC and fiberglass. So there is no other energy for this TTR device to detect other than what the pyramid itself is emitting. This image shows us the concentration of negative ionization (or air molecules) through the PVC pipe. (Notice the light areas which wrap around the outer wall of the pyramid structure.) According to the image, this energy seems to concentrate within this piping all the way to the top of the structure. This data is impressive, to say the least. However, this was not the only energy this device was able to capture. Another test done by these scientists was to view this pyramid from a distance of 30 to 60 km (18.6 - 37.3 miles) from the pyramid, and to take readings with this TTR device. What they found amazed them. They took readings of a concentrated column of negatively ionized air emanating from the top of the pyramid like a beam. (This negative ionization is actually very beneficial to health.) However, this beam was not simply coming out of the point of the pyramid, as one might expect. This beam was 500 meters wide (1500 ft) and 2000 meters high (6000 ft). The pyramid was actually beaming this ionizing energy into the sky for over a mile's distance. Not only this, they were able to read a secondary area of ionizing radiation which permanently altered the atmosphere above this pyramid up to 2000 m and in the surrounding landscape out to a diameter of 300 km (186.41 miles). This phenomenon is known as “latent vacuum structuring”, according to Wilcock. It is a fundamental, and permanent change in the energetic makeup of the area as a whole. This means that even if the Russians were to dismantle the pyramid and completely get rid of it, this ionizing energy would remain completely intact. ...But what is this ionizing radiation, and why is it significant? Ionization is what an air purifier does to clean the air around it. These devices release negative ions into the air, which attract all of the airborne impurities. These impurities then fall to the floor (or ground) and out of the air so that they are no longer a hazard to breath. So this ionization of air helps get rid of pollutants, odors, and any airborne particles harmful to people and organisms. 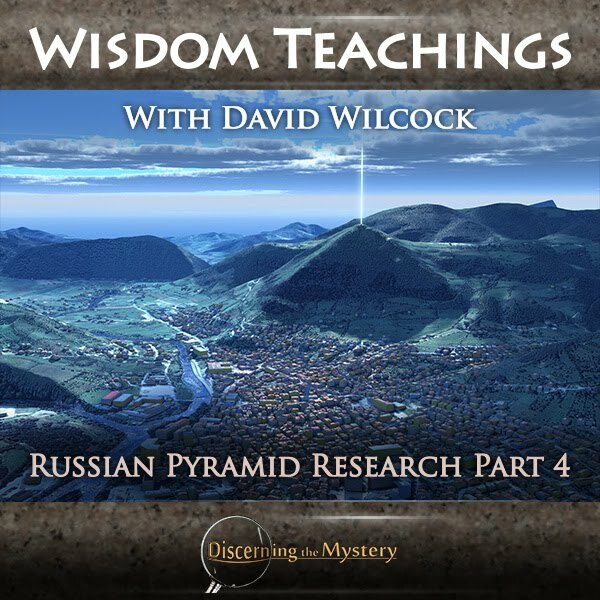 Wilcock makes the point that these pyramids are passive energy generators. All they need to do is sit there, and they accomplish this massive amount of work without any moving parts. They are able to ionize such a large area of atmosphere and land, which is not at all a small task. The largest industrial air ionizer I have seen only treats a room roughly 130 cubic feet in area and requires 50W of electricity to run. Imagine how much power you would need to ionize an area of roughly 917 cubic miles (this includes the air-space a mile above the ground and a circle 185 miles in diameter). It boggles the mind to attempt to imagine just how much energy these pyramids are generating for free (though it did cost around $1 million to build, but that is not at all a high price compared to the benefits gained). In the last article (and last week's episode) there was the topic of the improvement of the overall health of those living around these pyramids. This air-purifying effect was likely one of the main causes of this improvement of health, though there was more to this curative effect. These pyramids not only cleaned air, but cured psychosis, cancer, diabetes, pain, arthritis, and birth defects as well, according to Wilcock. From my understanding, this is due to the principle of the fluid universe, and the inflow of gravity into all matter. All cells need this energy, as it is essentially life force. Pyramids consecrate this energy and distribute it into the surrounding area. This increased life-force energy means better health for all of those within the area. However, these health-improving effects weren't the only effects these pyramids had on the surrounding land. The ionization was even found to be able to charge batteries. 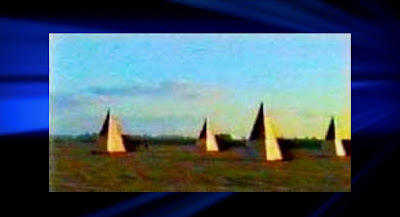 Wilcock discussed how these scientists placed a battery at the top of these pyramids to see if the ionizing effect would create electrical current. They found that they very much did. 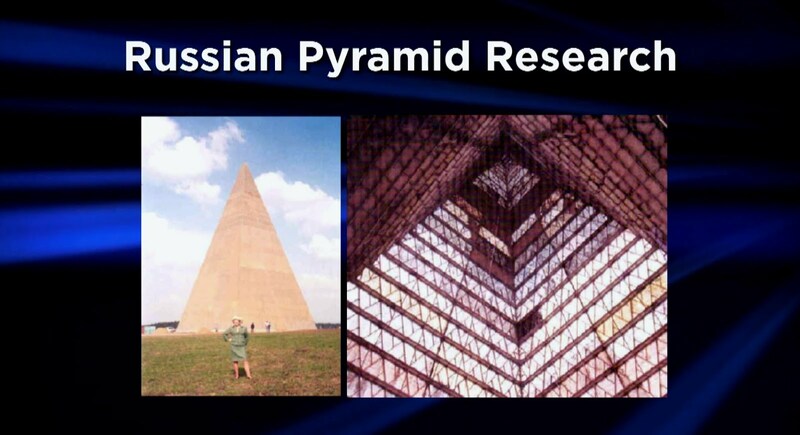 By my understanding, the Russian scientists believed that the top of the pyramid would be the best location for the battery. However David Wilcock had a slightly different idea. There is one particular subject of mention which I found interesting. Wilcock explains that when you have an area of high ionization, you will start to accumulate oxidation on any metallic surface susceptible to this process. This would mean that oxidation would happen at a quicker rate than it would naturally. The passage above describes what sounds to be the oxidation of a particular battery which they may have been charging. According to the texts, this battery had pieces coming off of it which would then float upward as though caught up in this ionic wind. This would likely explain that particular point in the above text (point 'c', first paragraph). 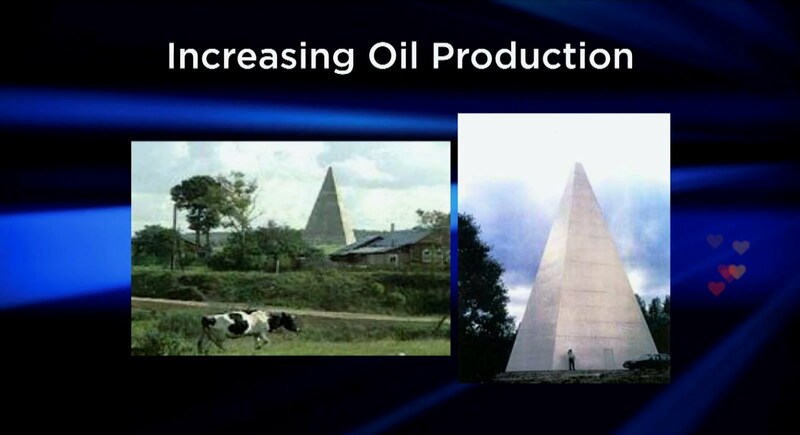 Another experiment was undertaken by these scientists to see how the pyramid effect impacted the production of oil wells. What they found would likely floor any oil tycoon. These scientists, under the guidance of the Gubkin Moscow Academy of Oil and Gas, found that placing pyramids over oil wells decreased the viscosity of the oil by a whole 30%. To put this into perspective, oil viscosity is the quality of oil that determines whether or not it can be pumped out of the ground. The lower the viscosity of the oil, the easier it is to pump. Along with this effect, its contents of gums, pyrobitumen, and paraffin also determine whether or not it can be pumped (the lower the contents, the more productive the well will be). With no other change but the presence of the pyramid, this 30% increase in production, and reduction of impurities resulted. Wilcock makes the point that this technology could revolutionize the oil industry (though with such technology, one may wonder if we would need oil for energy at all). To increase productivity by such a drastic amount simply with the presence of a pyramid is unheard of. As you may have noticed, these scientists believed in being thorough. They had a lot of possibilities to research and one of these was within agriculture and food production. To conduct this research, they employed two methods. The first one involved taking a very large amount of seed cultures and placing them in the pyramid. (The control group was, of course, not exposed to pyramid energy.) These seeds were left inside the pyramid for 1 to 5 days and then sewn. The amount of seeds sewn was enormous. These scientists used tens of thousands of hectares of seed. (One hectare is equal to 100 acres.) So, again, you can't beet them for being thorough. In each case, the pyramid seeds yielded 20 to 100 percent increase in production. The data also emphasizes the point that there were no sicknesses involved, no droughts to affect the experiment, and no significant toxifiers in either set for this experiment. In other words, all variables were accounted for and minimized. It seems clear that many of these results, if made public, would render both big pharma and the biotech industries obsolete. These scientists noted these amazing findings, but didn't stop there. They decided to see if incorporating granite that had been treated inside the pyramid would yield similar results as treating the seed directly. It did. Using nothing more than rocks, these scientist used pyramid energy to increase the yields of harvest dramatically. Another notably significant result of these pyramid experiments involved the ability of the pyramid energy to some how convert poisonous and radioactive material so that it was less harmful to living organisms. According to Western science, this is impossible, but again, Western science has no ground or fact to speak from on the matter, as much of the establishment chooses to make assumptions as opposed to doing actual research on pyramids. These detoxifying effects included the decrease in the half-life of radioactive substances. Again, this is impossible according to Western science. As Wilcock states, the half life of any radioactive material is believed to be fixed. It is not supposed to be able to change like this. Yet these scientists proved that pyramid energy is able to reduce the half-life of these materials. On top of these groundbreaking discoveries, these scientists discovered that pyramid energy was able to kill of pathogenic viruses and bacteria simply from exposure to this energy for a period of time. An even more surprising result was the ability of these pyramids to change the molecular makeup of substances so that they were less harmful to people. Some of these substances included narcotics. It was found that not only did the pyramid energy reduce the effectiveness of these narcotics, but that the diminishing effect was transferable. In other words, if a person was under the influence of some substance and they went into a pyramid, they would sober up. It was found that even if the person under the influence was around people who had been in a pyramid, they would sober up still. These pyramids were also able to help drug addicts and alcoholics recover much faster and kick their addictions. Other effects of this pyramid energy included the assistance in recovery of incarcerated prisoners. This energy was introduced into the cells by installing tiles made of granite which had been treated inside the pyramid. The prisoners who occupied the granite cells were better behaved, more mild in temperament, and had a general quicker rate of recovery. It has been discussed in previous articles that gravity, inertia, the Coriolis Effect were each caused by the same influx of energy we have been discussing. This influx of energy could also be described as torsion energy, as this energy also propagates as though through the universal fluid. It could be said that torsion waves are like ripples in this universal fluid of gravity. We have the concept of this flow of energy into the Earth (as well as all matter) in a spiral formation. ...But where can we find proof? To answer this, we turn to torsion physics. In 1913, Dr Eli Cartan was the first to demonstrate clearly that the "fabric" (flow) of space and time in Einstein's general theory of relativity not only "curves", but it also possesses a spinning or spiralling movement within itself known as "torsion". Most people are unaware that it is now generally accepted that the space surrounding the Earth and perhaps the entire galaxy has "right-handed spin", meaning that energy is influenced to spin clockwise as it travels through the physical vacuum. According to Sciama et aI., static torsion fields are created from spinning sources that do not radiate any energy. However, once you have a spinning source that releases energy in any form, such as the Sun or the centre of the galaxy, and/or a spinning source that has more than one form of movement occurring at the same time, such as a planet that is rotating on its axis and revolving around the Sun at the same time, then dynamic torsion is automatically produced. This phenomenon allows torsion waves to propagate through space instead of simply staying in a single "static" spot. Thus, torsion fields, like gravity or electromagnetism, are capable of moving from one place to another in the Universe. Furthermore, Kozyrev proved decades ago that these fields travel at "superluminal" speeds, meaning that they far exceed the speed of light. If you can have an impulse that moves directly through the "fabric of space-time", travels at superluminal velocities and is separate from gravity or electromagnetism, you have a significant breakthrough in physics - one that demands that a "physical vacuum", "zero-point energy" or an "aether" must really exist. To add to this passage from the Divine Cosmos website, here is a short excerpt from the Amasci.com site on one important detail on torsion waves. Torsion fields transmit information without transmitting energy, and they propagate through physical media without interacting (in traditional sense) with this media. But propagating torsion fields alter the spin state of physical media. Thus torsion fields can be detected by various types of detector. Torsion fields cannot be shielded by most materials, but they can be shielded by materials having certain spin-structures [55,75]. The lower bound of torsion signal velocity is estimated at 109c, where c is the velocity of light. This is due to the fact that torsion fields are identical to the transverse spin polarization of the physical vacuum . Again, we see that Russian, scientific research found that torsion waves pass through materials without interacting with them. This lack of interaction (in the traditional sense) takes place because these waves propagate through the foundational, fluid substance from which everything in the universe is formed without actually having a mechanical effect on the matter itself. In the last article I wrote on pyramid research, I brought up the concept of the phi ratio. This is a well-known, mathematical constant which we see everywhere in the universe, at every level of scale. At the same time, we have this torsion energy which manifests in the form of fields, and the waves which can propagate through them. To add, we have the established theory and supportive data that this torsion/gravitic energy creates all matter and order in the universe. I think that it is very possible that this manifestation of the phi ratio serves as undeniable proof that this theory of gravity/torsion energy is true. The energy forms matter. This is why we see the exact same energetic signature (phi) in all life and within living systems. The phi ratio is the footprint of torsion/gravitic energy. On the subject of my own personal experiences with pyramid energy, I have noticed a few things. Both drinking pyramid water, as well as lying down under my pyramids, I have noticed an increase in overall energy (though my physical activity is not extremely substantial). The more water I drink, the better I feel. Although, since my pyramids are only so big, I can't fit that many containers under them so as to have as much as I would like. I have also observed the differences between pyramid water which was treated for 3 days and that which was treated for 4 days of more. After the 3-day mark, the water has a very noticeable tingling sensation to it. After the five day mark, when drinking the water from an open glass, I can actually feel pins and needles on my eyeballs. 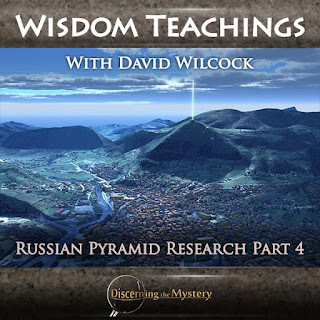 (It should be noted that the amount of pyramid energy absorbed over the course of any time period may vary greatly depending upon the size of the pyramid in use, according the Russian research.) This may not be the most comfortable sensation for some, but I've become accustomed to it. The water has a way of causing an energetic buzzing sensation throughout the body. I have also noticed it has a way of making the body more sensitive to other types of energy (not necessarily in an uncomfortable way, but the sensitivity is noticeable). I also noticed a tendency for house plants to grow more robustly when exposed to pyramid energy over the course of a few days. There is one plant that I have that wasn't doing too well. (This is a medium-sized houseplant that I received as a gift.) It was basically hanging out of the pot as though it was on its last leg. After a 3 to 4 days of treatment in one of the pyramids, it became more vibrant in appearance, stronger in structure, and sprouted new growth. The only change that I made to this plant was placing it underneath the pyramid. Many have heard of the supposed rumors that were being spread by unfamiliar personalities that nuclear engineer, M.T. Keshe was some kind of scam artist. After this, it seemed that some chose to ride this bandwagon without bothering to gain first-hand knowledge on the matter. I've done what I can to gain this first-hand knowledge myself, and from my studies, I can say with 100%-certainty that Keshe's technology is real, it works, and has quite a bit in common with pyramid technology. While I was doing my own experiments with pyramids, a good friend of mine was doing her own tests on M.T. Keshe's technology. What we found was very similar. Both of these technologies seemed to harness and emit an energy which has significantly positive effects on the human body. The process discovered by M.T. Keshe is referred to as "GANS production" or "nano-coating". (GANS stands for "Gas At a Nano State".) This is a fairly extensive process, and requires a bit of patience and attention to detail to complete. However, it is very easy for anyone who is diligent, and willing enough to do all of their homework (though, admittedly, I myself have not yet had time to complete one of my own batches). There are a few steps to complete in order to create GANS, and these depend upon the intended use. In general, the process includes the combination of a few simple chemicals, which when successfully combined, produce and catalyze what Keshe terms a “magnetic gravitational field”. (This term should ring a few bells.) From our study of pyramid technology, we will know that this is very similar to what pyramids do. Pyramids create a concentration of localized, gravitic energy simply by sitting there. Their shape induces an acceleration of gravity in the form of a vortex. As we have studied, it is this shape power which allows the pyramid to function as it does. Now, lets ask a question. What if we could create an energetic/chemical reaction which produced billions upon billions of quantum pyramids? As we have discussed in previous articles, gravity works at every level. It powers the black hole the same way it does the atom, according to the new model of physics. No matter what size an object is, it will always absorb gravity in the same way. If this is true, it should apply to pyramids as well. No matter what the size of the pyramid, it will always create the gravitic vortex, as well as the concentration and acceleration of natural, gravitic flow. Consequently, it will always create healing effects, ionization effects and electrical flow, and even air purification effects. (This would explain why the GANS cup is a recommended application of GANS technology. It looks to be a personal air ionizer and purifier.) If this is the case, it may very-well create the exact same effects which pyramids do, just without the visible structure. We know that pyramids absorb the energy of gravity in a way which creates a greater rate of flow to the bottom of their structure than to the top. This is a result of shape-power. Now imagine that someone learned to create billions and billions of pyramid-like structures using a combination of chemical and energetic reactions. In the case of the different nano-coated metals depicted in the video demonstration, if one metal was naturally able to form more molecular/energetic pyramid structures, it would then be able to absorb more gravity. 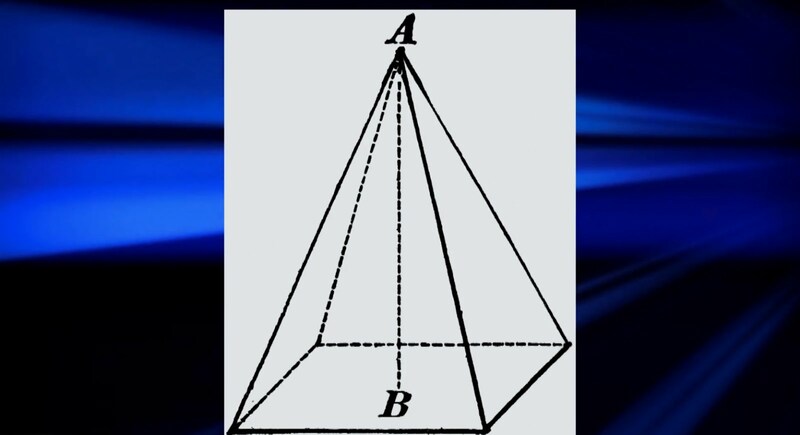 This would in tern, create the same gravitic bias we see from the shape power of the pyramid, and just as in the pyramid, this gravity would lead to a permanent, ionic bias, and electrical current. If you have been able to see first hand that pyramid power is real, like I have, and you understand the implications it presents, you will see that Keshe is anything but a “fraud”. His ideas are ingenious, in my opinion, and all he likely did was consider how to use sacred geometry to revolutionize the field of nuclear physics. Aside from the technical explanation, I was able to test to see what the GANS energy was like, and from my experiences, this energy feels very similar to pyramid energy. I was able to get rid of aches and pain immediately, and had the side effect of getting rid of a few skin blemishes as well. (The pain was severe, but all it took was the GANS pad, and nothing else. With the pad, the pain is completely gone.) These are only the effects which I have visibly observed. There is much more to study, and I would encourage everyone who feels able to, to do your due diligence and gain your own first-hand knowledge of these concepts. If done responsibly, this is a sure way to find reliable truth. The pieces are finally beginning to come together, and this ride is only getting started. I've been waiting for this for a long time, I'm sure you have as well. So keep reading, keep searching for truth, and keep moving forward. Lets see what the future brings. For more information on how to accelerate the process of Full Disclosure, click below.